This is the third in a series of reports exploring the costs, benefits, and other impacts of state renewable portfolio standards (RPS). This report evaluates the effects of renewable electricity used to meet aggregate RPS demand growth prospectively, over the period 2015-2050, under both current RPS policies as well as a potential expansion of those policies. 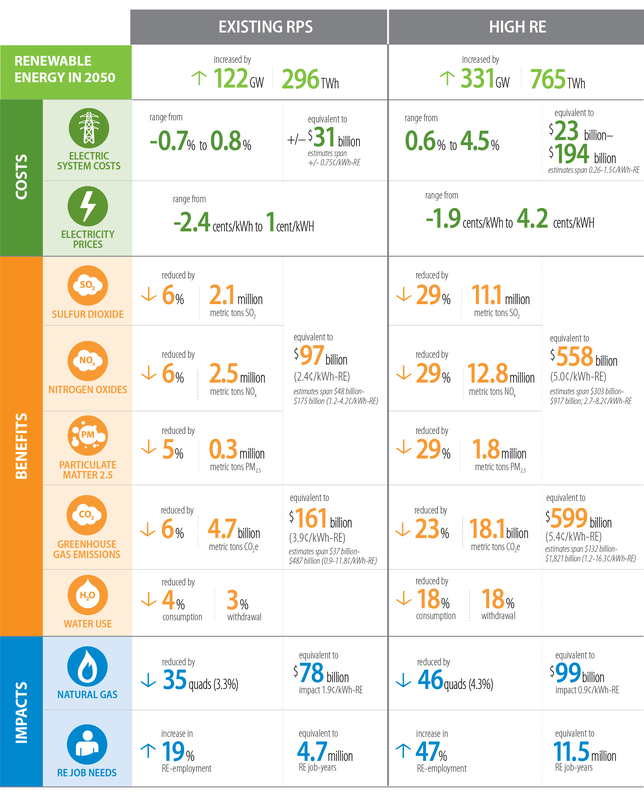 Relying on a well-vetted suite of methods, the report quantifies: the costs to the electric system and retail electricity price impacts; the potential societal benefits associated with reduced greenhouse gas emissions, air pollution emissions, and water use; workforce requirements and economic development effects; and consumer savings associated with reduced natural gas prices. The study quantifies these effects in both physical and monetary terms, where possible, at both national and regional levels, and characterizes key uncertainties. The two prior studies in the series have focused, instead, on the historical costs and on the historical benefits and impacts of state RPS policies. A link to a journal article published in Environmental Research Letters can be found here.